Photo courtesy of John H. Long, Jr.
Marvin H. Long was born (9 Aug. 1919) to John Hartsell Long Sr. and Susan Lorena Jane (Clemens) of Maryville, Blount County, TN. He was 25 yrs old at the time of his loss. He graduated from Maryville High School. He worked for ALOCA Aluminum in Aloca, TN, an ajoing town of Maryville, TN. He attended Maryville College while attending working there. 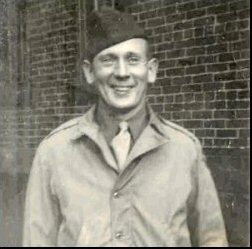 WWII Enlistment Records show his enlistment was 7 Aug 1943 at Ft. Oglethorpe, Georgia. He married Dorothy Jane Shields. She later married after college in New York to Arthur Lucas (1) some time in about the late 1940's. (1) regarding 2nd marriage - John H. Long, Jr. (brother); additional source: "The "Connection" in East Tennessee by Izora Waters Frizzell, Olga Jones, Edwards pg. 109.